But from what we remembered of my grandpa’s cookies, these weren’t them. Theses were too light and fluffy, like little sponge cakes. Delicious and airy, these cookies were wonderful on the Saturday afternoon before Easter. But his were denser, more like shortbread, from what I can recall. So over the next few days, I tested out two other recipes from Julia Child: from her cookbook, The Way to Cook, and also from her original TV series, The French Chef (season 9, episode 7). All three recipes were quite different, and all tasty. The one featured below is made of an egg-yolk genoise. The oldest recipe used whole eggs, while The Way to Cook’s instructions called for a doughier cookie that turned out crisp. I’d made this into my own Proust-esque cookie search, trying to determine which recipe coupled the right memories. I’m not sure which ones were my favorite, especially since the second two batches included lemon zest, which brightened up the cookies tremendously. But maybe there’s not a “right” cookie (for Proust or from our cookie exchange). Maybe the cookies are meant to just be enjoyed in the here and now, simple and delicious. Simple ingredients: butter, flour, eggs, sugar, vanilla. Start off by combining eggs and sugar. Beat until airy, pale and tripled in volume. Gently fold in flour. 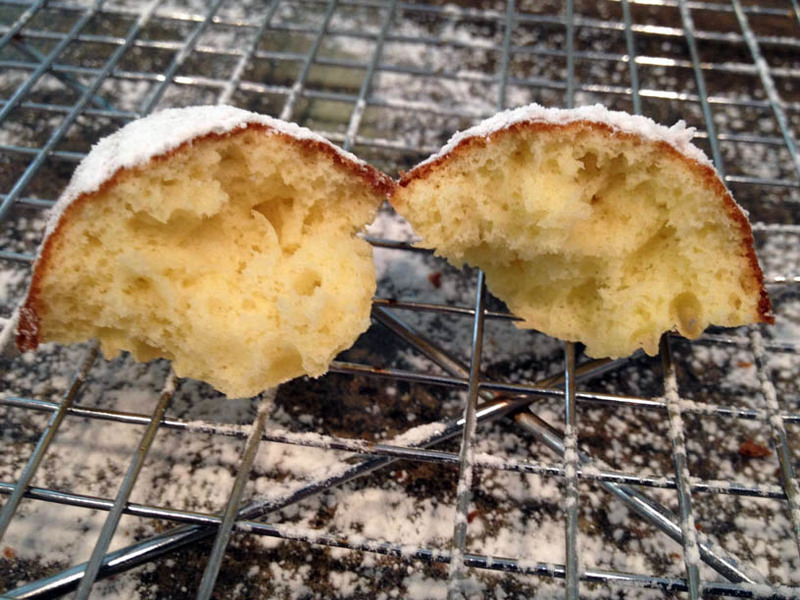 Scoop or pipe into the buttered and floured madeleine pan. This recipe doesn’t call for resting time or cooling the pan. Powdered sugar hides any mistakes. I’m sure you could add citrus zest to these madeleines from baker Flo Braker’s ladyfinger genoise, or other flavorings as well. (Here’s the PBS video.) Simple to mix together, they yielded shells with the telltale little humps. Even though we overcooked them a smidgen, they didn’t taste overdone. I’d recommend keeping a close eye on the pans and as soon as the edges of the cookies turn a golden brown, pop them out of the oven. Dusted with powdered sugar, you can’t even really tell. Or add a glaze (chocolate? lemon?) or a dollop of jam, and enjoy. Pour the melted butter into a 1-quart bowl; reserve. 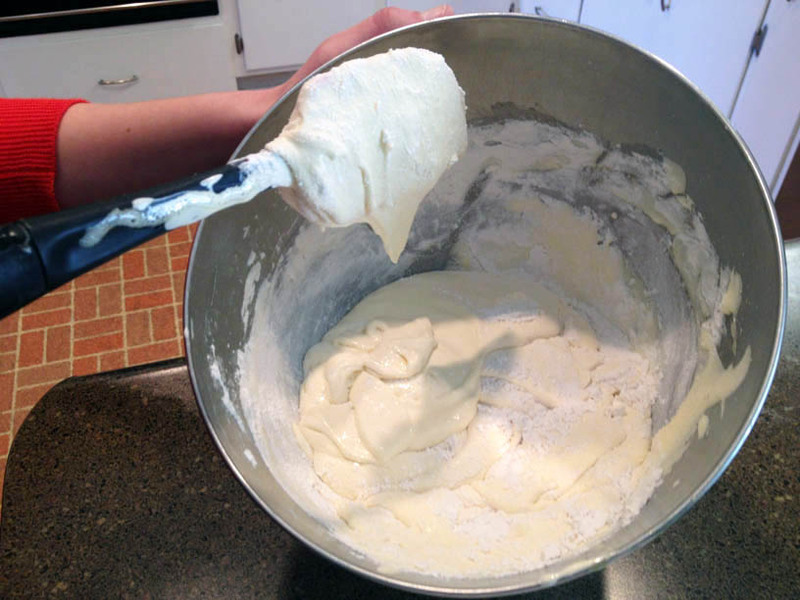 Put the sifted flour, and 1 tablespoon of the sugar into the bowl of a heavy-duty mixer (or work with a hand-held mixer). 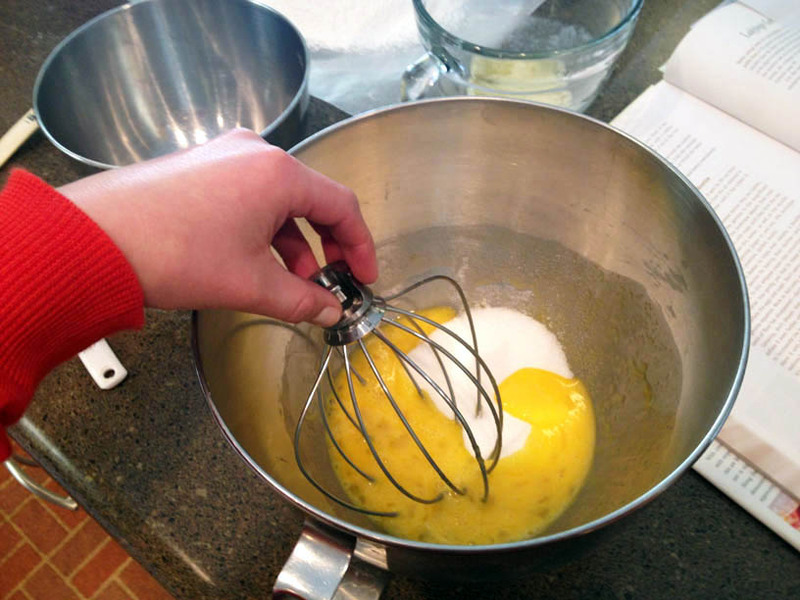 Holding the whisk attachment from the mixer in your hand, beat the mixture just to combine. Add the remaining sugar and whisk by hand to mix. With the bowl and whisk attachment in place, whip the mixture on medium speed until it is airy, pale and tripled in volume, like softly whipped cream, 4 to 5 minutes. 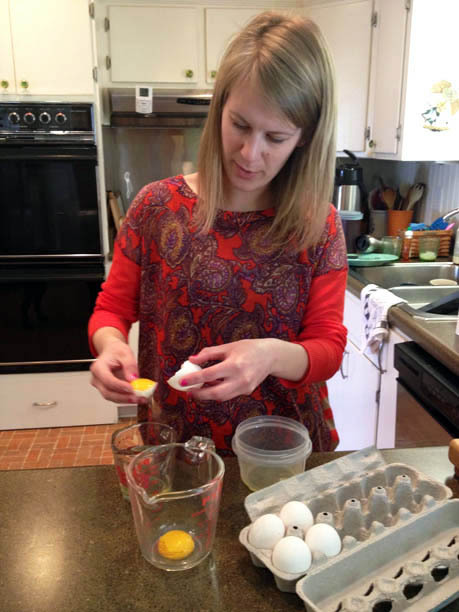 You’ll know that the eggs are properly whipped when you lift the whisk and mixture falls back into the bowl in a ribbon that rests on the surface for about 10 seconds. If the ribbon immediately sinks into the mixture, continue whipping for a few more minutes. Pour in the vanilla extract during the last moments of whipping. Detach the bowl from the mixer. Sprinkle about one third of the flour mixture over the batter. 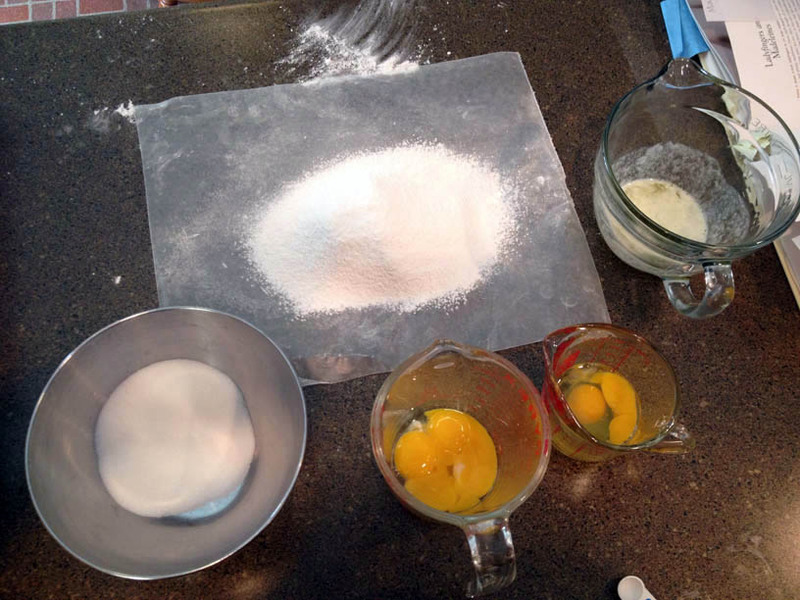 Fold in the flour with a rubber spatula, stopping as soon as the flour is incorporated. Fold in the rest of the flour in 2 more additions. The batter is now ready to be used and, in fact, must be baked immediately. 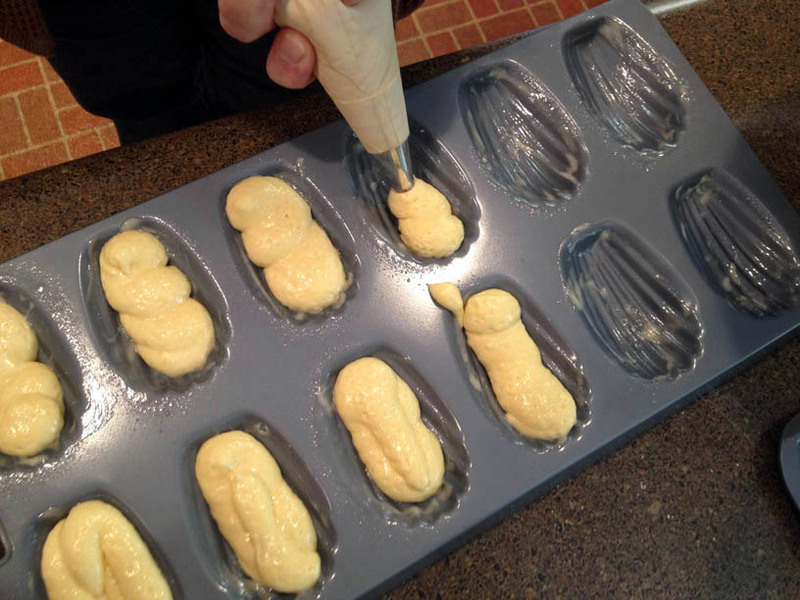 Baking the cookies: Using a spoon or pastry bag without a tip, fill the molds with the batter. 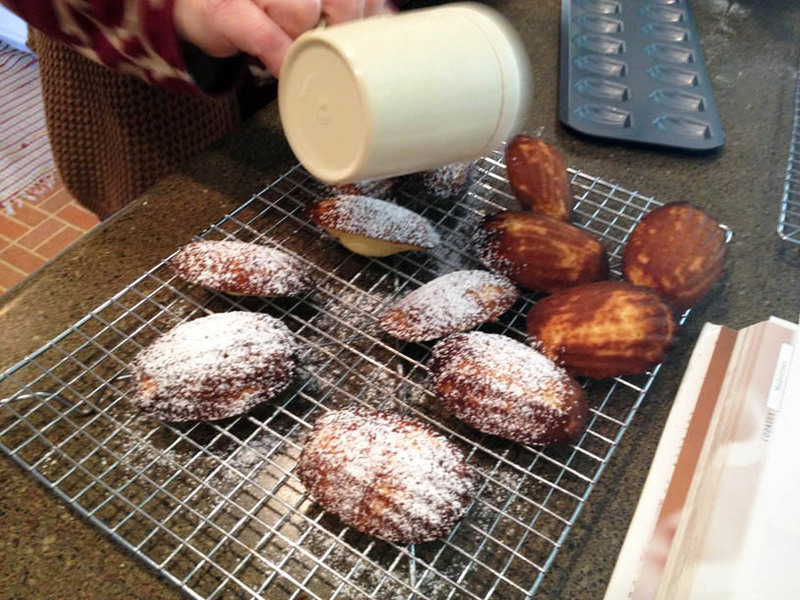 Bake for about 10 minutes, until the madeleines are puffed, spring back when prodded gently, and start to come away from the sides of the molds. 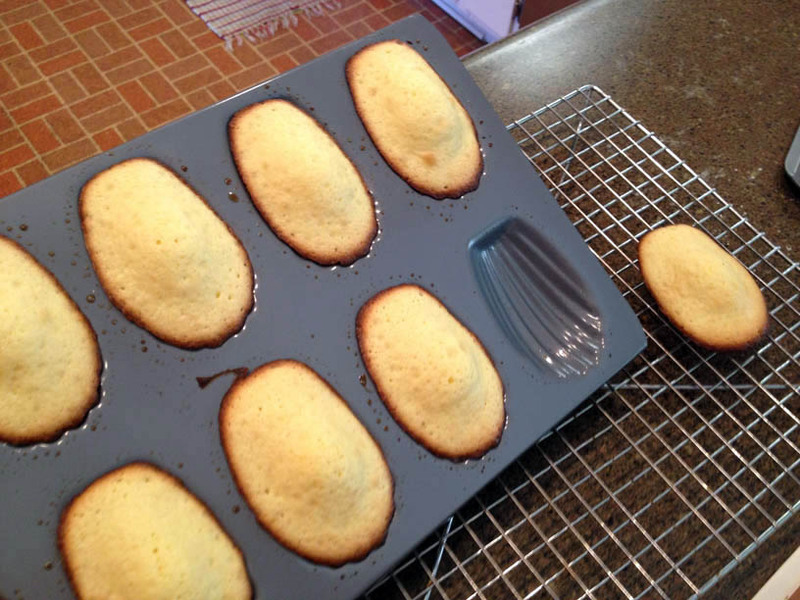 Let the madeleines cool for a minute or two before turning them out onto a rack to cool. Dust with powdered sugar. Storing: Both ladyfingers and madeleines are best the day they are made, although slightly stale madeleines are wonderful dipped in tea, a la Proust. You can keep the cookies in an airtight tin for a day or two or freeze them for up to the 10 days in a plastic container with waxed paper between the layers. Thaw, still packed, at room temperature. Gorgeous Madeleines, ladies! Great post and photos….thanks for hosting! Proustian or not, yours look so pretty! Thanks for hosting! Thanks for choosing such a great recipe – very easy to make and delicious! Love all your prep photos – so professional! Thanks for hosting! I have fond memories of my Grandma’s baking, especially her pies. We have the recipes, but they don’t taste as good as I remember them. I think memory is like that. Beautifully done – thank you for hosting this week! The only time I’ve eaten madeleines in my life was when I visited Proust’s hometown in France! Yours look lovely. Thanks for hosting! 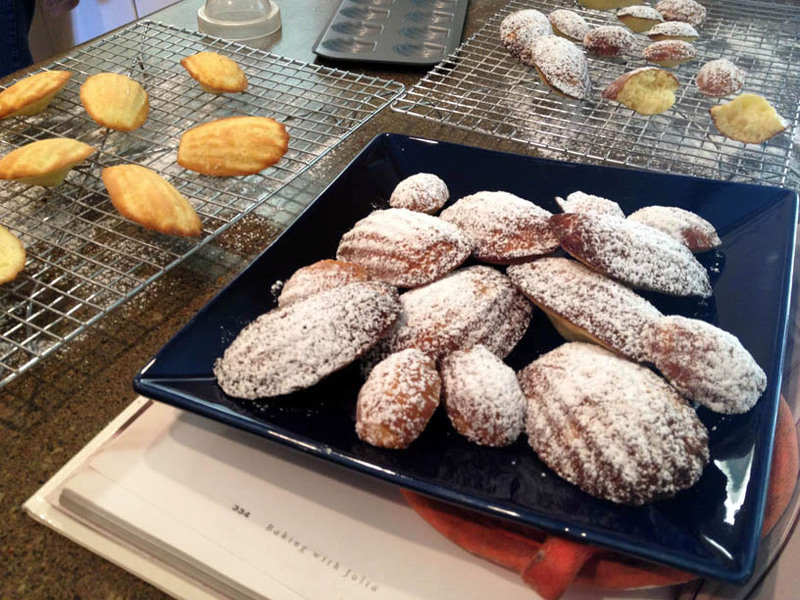 The shape of your madeleines is traditional, no matter if the taste is the same as Proust’s or not. I hope you figure out your grandfather’s version. You obtained the little hump! Mine did not appear. Good luck in finding a recipe close to your grandfather’s version. I would have liked a more cookie texture rather than the spongy/rubbery texture mine had. Wonderful job hosting! Thanks for hosting this week. Your mads are lovely. Thanks for hosting!!! They look great! I’m sure you’ll find your grandfather’s recipe soon and I hope you end up posting it. I would love to try it!